This is what pisses me off. Even in light of a formal, public and judicial review that is fully backed by the legal sphere such vile individuals still exist. Here in Scotland we have a vile pro independence blogger called Wings Over Scotland and he was, as the jury was delivering it's verdicts, continuing to spread and back the establishment lies and comments he had made 4 years ago. And the worst thing is this c**t gets retweeted by SNP politicians week in week out. it genuinely saddens me that there are people who are so fu**ed up they think its clever to post stuff like this. They are everywhere mate. Attention seeking trouble causers. The best way is to pretend they dont exist and pay them no attention, they dont like that. Hi to all you Scousers from a Dagenham and Redbridge fan - very much in peace. Quite simply I am so very, very sorry for doing something my mum taught me as a child; namely to quietly trust and accept the police's story about what had happened. I regret to admit that for perhaps 15 years to two decades or so until the whole thing was reviewed and then revelations started leaching out, I had, without putting much thought into it, basically unquestionningly accepted what the media had published and broadcast about what had happened that day in Sheffield on the part of the police. The more that has come out though the more uncomfortable I have felt in myself for simply trusting the police. I didn't "jump to conclusions" like others, I just didn't question what was said because as I have said on our own forum here http://www.viewsfromthesieve.co.uk/viewtopic.php?f=3&t=1948 why would any reasonable, rational adult want to question anything that the police might say They don't lie, do they? The way I feel about myself brought about from the lies from the police are insignificant to the losses of the bereft families; but we are all people and all citizens of the same country. I know I cannot be the only person elsewhere in the country who just accepted the police's view on events but the rest of us haven't lost members of our families and it wasn't perhaps as important to us as it was to you. What more can or should I say? My mum meant well when she brought me up by instilling that I should always trust a policeman. How should I feel about myself when one of the binding cornerstones of my own values is laid bare like this as just a grubby pack of lies and half-truths. Is this for real? Trust a policeman now? My friends, if a policeman were to roll up here and tell me it were raining, I would feel compelled to open the window and stick my hand outseide to see if it were getting wet. But society DOES need the general public to trust the police for rapes, break-ins, lost children, murders, etc, etc, etc. Who do we (and I mean all of us in the country) trust in future? That's about it. That's all I wanted to get off my chest here. To apologise for my misplaced unquestioning trust elsewhere and to belatedly offer my heartfelt sympathies to the families of those who lost their lives and to the city and people of Liverpool. You should never have been left to walk and face this alone. I'm assuming it was the one that was being used to show us the aerial TV pictures - so I'm glad it was there! The chief constable of SYP gets suspended but it turns out he retires in November anyway. Suspended on full pay pending (an illness delayed) disciplinary in November then? Oh, I agree, Andy Burnham was absolutely fantastic today, it was a truly powerful speech. No lover of Tories, but I have to give credit to Theresa May as well, I thought she was very impressive. Credit where credit is due. Dodgy Dave also threw in his saucerful, yet they still worship the fuckers who instigated the whole cover up - Thatcher and her cohorts. She was and still is a Tory icon. You should never have been left to walk and face this alone. Thanks for signing up to share your post. Peter Wright was Chief Constable at the time of the Hillsborough tragedy, he appointed David Duckenfield as match commander and Wright subsequently blamed the supporters for the tragedy. The establishment no doubt think it convenient that their mouthpiece died in 2011 and all the lies and corruption was buried with him; the cover up and wrongful allocation of blame continued until the second inquest. Why was Wright never brought to account? Who shielded him from any investigation? Why was he allowed to continue in office after making such outrageous claims? The answers to these questions lead to the true culprits of the whitewash conspiracy. Thing is, there is no way that I want to have to tell my 10 month old and 6 year old sons that you can't trust a Policeman. Justice for the 96 and them also being able to now, finally, rest in peace with the true story now proven in a Court of Law along with the families being able to now have some comfort after 27 years of fighting the Government and the Media is not absolutely everything of what this battle has been about. If, God forbid a tragedy like this happened again would the Government, Media and Police Forces, et al try the same tricks again? I very much doubt it but without the fight that the Families and the City put up I'd hazard a guess that it could have. "We got away with it once so we will get away with it again" springs to mind. I don't blame you for believing what the media said as that's what the media wanted and that's what the media done to a certain extent. I live in the hope that I can tell my children that they can trust a Policeman and aswell as bring justice for the dead that is what this fight has done and, to me, is why the likes of Dukenfield and every other single person who contributed to this whole damn mess and it's cover up needs to be brought to justice and punished accordingly. Anybody from outside looking in who thought the whole thing was annoying or that Liverpool fans were playing the victims or that it is a self pity city should now actually thank the families as this battle could well have an affect on their and their children's lives and futures for the better. We should all be able to tell our children that they can trust the Police in the knowledge that any wrong doings within a force are in the minority and will be dealt with and the culprits brought to face charges. Laws need to change for that to happen, still, but the calls are getting louder for the changes now as a direct result of the battle these families put up and will still put up. And again, thank you for joining up and posting that as it's great to see. Fair play to James O'Brien, not a lot of people in his profession are putting their necks on the line and taking on murdoch but he's had a go so well done that man. If, God forbid a tragedy like this happened again would the Government, Media and Police Forces, et al try the same tricks again? I very much doubt it but without the fight that the Families and the City put up I'd hazard a guess that it could have. I would think it's much harder to cover up the truth these days with the ease of having mobile devices that can instantly capture and post video and pictures for the world to see. People now can make their own widespread media coverage with social networks. Means a lot for you to post that. Everyone outside of Liverpool were meant to believe and accept the dark arts. NEVER take on this City. Possibly mate but by equal measure what the s*n did back then was by today's standards 'go viral' and once the mud's out it sticks, and in this day and age those numbers would be huge and one thing I've noticed with the internet and social media these days is people's inability to admit they were wrong, especially when they read it on the internet. If f**king kanye or f**king Kim tweet it, it must be f**king gospel. Unless it's the Everton part at football, then enjoy! THe FA in action again. Remember the 130 who died in Paris and we had the "solidarity" of landmarks being lit up with the French tricolour? We had the FA instruct all football clubs to play the Marseillaise before the games .......having also had it played in the Wembley international. On the upcoming Premier League games the FA basically have said Do something if you want to. Its accepted that due to tribalism in our football culture some clubs would have found it difficult to sing YNWA and quite frankly we wouldn't want that. Our brothers in Dortmund we are happy with. This country's most successful club of the 20th century. The F.A. double standards . Please the French , keep them happy ... but f**k the Scousers. They're sh*t scared in case something goes wrong so pass the buck is the order, proper sh*t houses. There are bad bizzles, there are good bizzles Dave as you say it is fundamentally wrong to generalise in any context. We then have to consider the conduct of the string pullers - the Tories. They used the same modus operandi for Hillsborough and a variety of which against the miners, the dockers and now albeit a little more refined, they are attempting to defeat the junior doctors with lies, innuendo and black propaganda. The opening gambit is subliminally suggesting the target is socially threatening, a compliant media form usually works. Persistence with this tactic will invoke right wing public support, to say nothing of the gullible, who are for want of a better phrase "f**king stupid". Division of the opposition must also be achieved in the quest for victory. The Special Services can be called upon if needed. When the opposition is totally demonised stronger measures can be utilised. The Tory guide to trouncing protest. Andy Burnham on Question Time tonight...no doubt Hillsborough will be discussed and rightly so..
the new acting CC of South Yorkshire Police has offered to stand down as she is already mired in "previous dubious conduct"
I've joined up just to post, as a Wednesdayite in peace. First off, I'm a Sheffielder. Don't live there any more, in Manchester now but I'm back there a lot and have listened to a lot of local radio both there and in Merseyside. 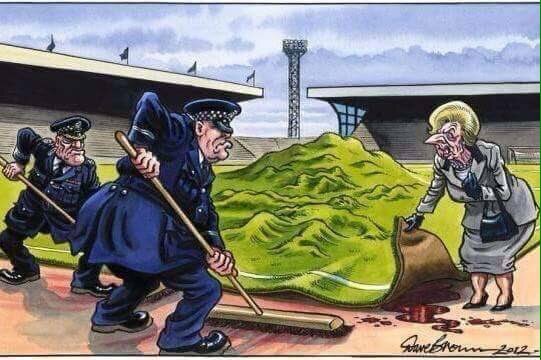 The verdict rightly blows apart the endemic problems in South Yorks not just with Hillsborough but also with the Miners Strike and so I have to pay massive tribute to the Liverpool families not just for the relentless struggle for justice for #JFT96 But also because now we may also see Orgreave revisited. As a lifelong fan of Sheffield Wednesday I want to ask what you think of bulldozing the Leppings Lane end. Many of us want to see that but I'd be pushing for it to be renamed, but I'm not sure what we'd call it. The 96 seats would have to remain memorialised as they currently are. In the event we go up this season, you'll be back there as away fans. We need to have some kind of commemoration in that event; I'm reasonably confident in the current club owners that they will do the right thing. Whenever our clubs do play against each other again I hope it is in the right spirit of friendship and solidarity that I know exists. I'm so sorry that our club acted like it did. Bert McGee died in 95 but Dave Richards and Graham Mackrell don't appear to fear any scrutiny. I don't know what else to say. I'm so sorry that our club acted like it did. Thanks for signing up to make your post. I worked in Sheffield's Northern General Hospital for a year 17 years ago. I lived the other side of the city in Brincliffe. I liked the people in the city but at work, on lets call it a weekly basis, I had debates/arguments with people (mostly the 'bosses' who should have known better) who had believed the lies. They will mostly be retired now. I do still think about them and their belief in the various theories. They used to say to me 'yeah but if your fans had tickets/not been pissed/not pushed etc'. Now I'm older and I've got kids of my own I actually feel sorry for those people. Living their whole life believing whatever newspapers or the authorities tell them to believe. So thanks for posting. You posting on here cancels out many of those knobheads I had to speak to as a young 20 year old who knew more about the way the world worked than those who should have known better.